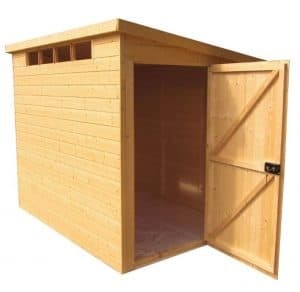 For those who want a good sized garden shed that has a bit of a different look, we have the Shire 8×10 Shed Pent Shiplap European Softwood Shed. This is one very smartly designed shed with a reverse pent design it is sure to stand out and be a major feature of your garden. This shed offers you plenty of floor space so if you wanted to, you could actually use this as some kind of workshop. 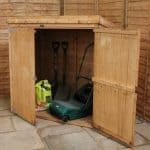 As far as general storage goes, you are going to be very impressed with how much storage space this shed offers. It even has a series of small glass windows on the front to let in a little bit of natural light. Made with 12 mm thick tongue and groove shiplap cladding, this is one very strong shed that is going to last for many years. This kind of cladding is strong, looks amazing and will keep the rain out. The door is also made to be very strong with some double z framing, a high quality set of hinges and even a lock and key so you can keep your items secured. In all this is one very good looking shed that is also quite robust. 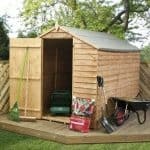 The Shire 8×10 Shed Pent Shiplap European Softwood Shed is a shed that has a style we really like. Its high windows and nearly fully boarded design really do give it an air of secrecy which we think is really cool. It is also a very good size. The width of the shed is 7 feet 8 inches and the depth is 9 feet 8 inches. This is a lot of floor space and if you are using the shed for general storage then you will be amazed at all the tools, gardening equipment or even play items like kids bikes and outdoor toys you can fit in here. The highest point of the shed is 6 feet 9 inches, so the headroom is fantastic. This impressive headroom means that you could actually spend a lot of time in here as it will be comfortable and not require you to hunch over. This makes it a structure that would work very well as a workshop as well as a shed. This has a pent roof and we really like how steep it is. This means that the rain will always run right off. The roof slopes towards the back and at the front there is a pretty decently sized overhang which will help protect the front of the shed from the rain. The roof is made with solid sheet boarding and covered with felt to help protect it against the elements. We really like the design of the Shire 8×10 Shed Pent Shiplap European Softwood Shed and we feel that most of the budget and the design process was spent on the cladding. They have gone for tongue and groove shiplap cladding which looks amazing. This cladding will not allow any rain in at all. We really like the smooth look of it as well and feel this is what gives the shed such a classy look. As well as looking impressive, this cladding is 12 mm thick so it is very strong. While Shire have not specifically mentioned what the size of the cladding is, here at WhatShed we have a few eagle eyed members of staff who noticed the frame in here is actually quite thick. You are most likely looking at a 28 mm x 28 mm frame, which is not bad at all. The frame has a good thickness to it, so we are sure it is going to really make this shed have a very robust feel. The design of this shed is something that we really like, but there is one thing that makes us say mmm in a Marge Simpson disapproving style, and that is the floor. Do not get us wrong, the solid sheet boarding floor that they have used will be up to the task and will take far more weight than you would think. We just feel that some tongue and groove flooring would have looked really nice and gone very well with the rest of the shed. 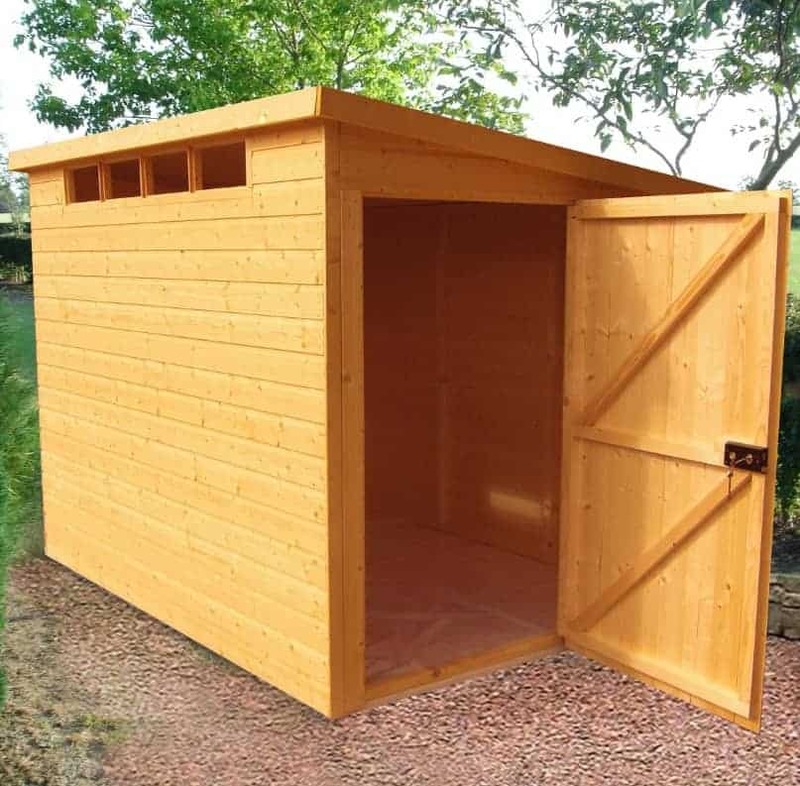 The Shire 8×10 Shed Pent Shiplap European Softwood Shed is dip treated so you will have to give it a coating of wood treatment once you have installed it. You will also need to make sure that you remember to give it a fresh coating once a year. The smooth cladding is what really captures your attention, so it would be a shame for rot to start to appear because you forgot to treat it. As long as you treat the shed properly then you will be covered by a ten year anti rot guarantee. This is actually a pretty good guarantee and it will hopefully give you that incentive to make sure you remember to treat it each year. This is a reverse design shed so the door is located on the side. We actually really like this design. As this shed has a pent roof that slopes towards the back, the rain should stay away from the door. This is a single door which is the norm for reverse designed sheds, but it is very well made. The door actually has double z framing and a set of very strong hinges so it is going to be one very strong door. On the front of the shed there are a series of four small windows located right at the top. We really like the design of these windows. They are much smaller than a traditional window, but they will still let in plenty of light. 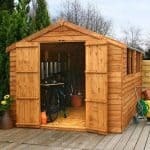 They are also very well made as they have been made from glass instead for plastic like many other sheds do. We have already talked about how the Shire 8×10 Shed Pent Shiplap European Softwood Shed has a fantastic door, but it is about to get even better. You see this door has an actual lock on it. This means that anything you place in here can be kept safely locked away. This added with the solid design of the sheds makes it one of the more secure 8 X 10 sheds we have seen. While there are four windows on the front of the shed this is still a very private shed. The reason for this is the windows size and their placement. This makes it very hard to look inside, so no nosey neighbours will be able to see your amazing tools, kids bikes or your plans for taking over the neighbourhood. There is not one single customisation option offered with this shed. As it does require treatment though, you could always use this as a chance to give it a bit of colour as there are many different colours of wood treatment available. You do not have to worry about being hustled to spend a fiver here and a fiver there on a whole bunch of unnecessary extras, as this shed offers none. This is not a bad thing though as it means there will be more money in your wallet to buy some cool items to fill up the shed with. We really like this shed and for the most part think that Shire did a great job, but we do feel that they cut a couple of corners with the roof and especially the floor. 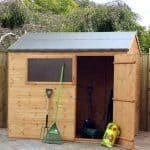 If you take proper care of the wood then there is no reason at all why this shed will not give you a lifetime of use. 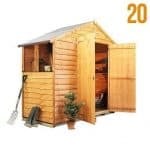 We are sure that anyone who purchases this shed is going to be very happy with the storage space that it offers. The headroom is also impressive as it will make moving around the shed nice and easy. You will need to get another person to help you out with this as it is quite large. But as long as that person knows how to use a hammer, can put the kettle on and does not smell too bad, then you will find this a pretty straightforward (and dare we say, fun) experience. This is one of the higher priced wooden 8 X 10 sheds we have seen, especially when you consider the floor is just standard solid sheet boarding. Final Thoughts: We really like the way the Shire 8x10 Shed Pent Shiplap European Softwood Shed looks. It has such a smart and modern look that we are sure anyone who sees this in person is going to be impressed. 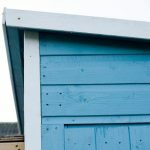 The cladding is very high quality and will keep the rain out as well as giving the shed a very strong feel. Our only issues are really with the floor. At this price, we really do feel that this should have a tongue and groove floor. Still, as long as you are not wrestling or hosting break dancing competitions in here, the floor should be fine. 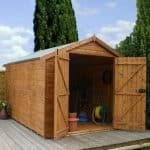 If you want a wooden shed that has a slightly different look, then this could be the one for you.